There are some foods you know could make you bloated, like beer or cheese. But gut drama can sneak up on you, too. Even salad can be the culprit—salad! If you experience that annoying uncomfortable feeling on the reg, sticking to a low-FODMAP diet could be the answer to your desperate digestive prayers. Never heard of it? The acronym stands for five different types of short-chain carbohydrates all linked to causing all sorts of tummy troubles. A lot of surprising foods are on the no-bueno list (hello, broccoli! ), which makes New York City-based dietician Danielle Capalino, MSPH, RD’s new book Healthy Gut, Flat Stomach a bloat-busting bible. All the recipes are low-FODMAP, use just a handful of ingredients, and can be made in 15-minutes or less. (Again: Stress less!) Here, she shares some of her faves. Scroll down for 3 gut-friendly recipes that take only 15 minutes to make—and will help curb bloat, too. 1. Heat a skillet over medium-high heat, and coat lightly with olive oil. Cook the bell pepper and spinach for a few minutes, until the spinach is wilted and the pepper has softened. 2. Whisk together the eggs and milk in a bowl. Pour the eggs onto the vegetable mixture in the skillet and cook until slightly set, about two minutes, placing your omelet additions on the center of the eggs before the eggs have set. Fold the omelet in half and continue to cook until the eggs are fully cooked. 2. Heat the sesame oil and grapeseed oil in a large skillet over medium heat and add the green beans. Lower the heat to medium-low and cook for five to seven minutes, watching to make sure there is no burning. The green beans should start to blister. Remove the green beans from the heat and stir in the toasted almonds and sesame seeds. 1. Preheat the oven to 400°F. Coat a baking sheet with the coconut oil and set aside. 2. Place the maple syrup and coconut milk in a medium bowl and mix well. Place the shredded coconut, brown rice cereal, salt and pepper in a zip-top plastic bag and crush well. 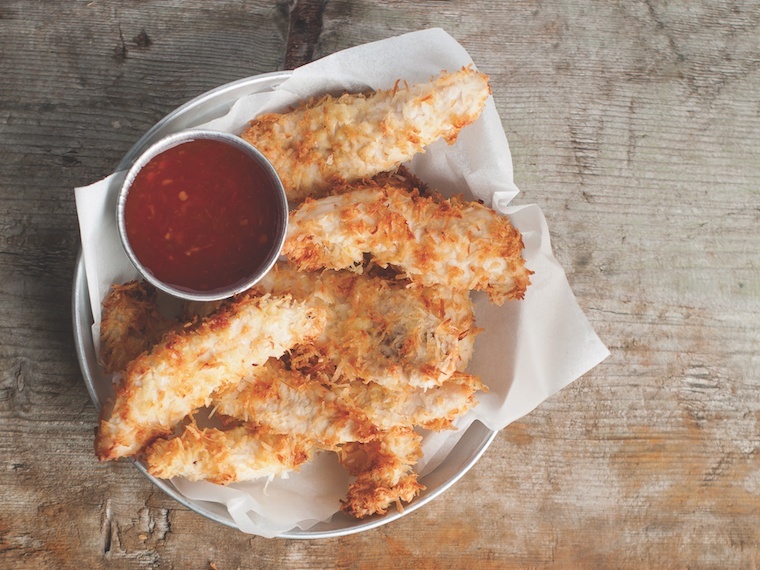 Dredge the chicken strips in the coconut milk mixture and place a few at a time in the bag, to coat with the coconut mixture. Transfer to the prepared baking sheet. Bake for seven to eight minutes per side, until the chicken is cooked through to 165°F. These dishes could be easily paired with an anti-inflammatory beverage, which will make your gut extra happy. And on weekends, how about this mood-boosting pancake recipe?